If you’d ever told me I’d be reviewing an album by an American, Mormon hiphop violinist I would never have believed you. 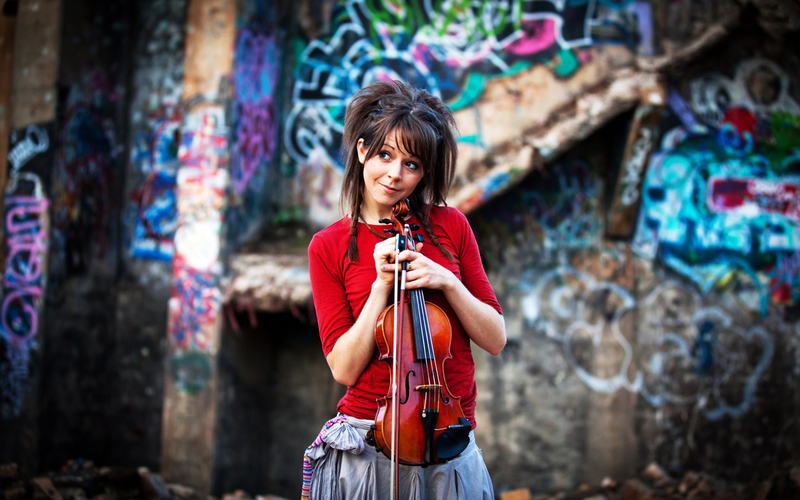 After appearing on America’s Got Talent, aforementioned violinist Lindsey Stirling realised the power of the internet and, realising she could create more publicity for herself than she gained from Piers Morgan slating her on international TV, started releasing videos on world renowned self-promotion platform YouTube. On discovering her video ‘Crystalize’ I, like many others, was spellbound by the sight of her ballet dancing in a coat and Uggs whilst playing the violin over an ambient dubstep bass. More discovery lead me to the infamous American talent show appearance, a series of EPs, and this, her debut album. On first listen, I didn’t know what to make of the fusion between dance music and violin. Did this feel incredibly innovative, or did it feel like a desperate attempt to make classical music “relevant”? Opening track “Electric Daisy Violin” does feel a little, well, twee … with its house beats and almost hoedown fiddle vibe. It could easily have been Vanessa Mae from over a decade ago. ‘Zi Zi’s Journey’ is where we step things up. With its dubstep opera feel, it sounds like a true collaboration against the opening tracks “violin + dance beat = innovation” formula. Single Crystalize, the first track I heard, is still a stunning example of what a great idea this album is. A beautiful and haunting violin melody, with a horrendously current but authentic dubstep bass, it’s the first thing I could hear being played outside of a trendy middle class dinner party, and it’s the first track to have repeat listening. The stunningly ambient ‘Song Of The Caged Bird’ maintains the standard well, with its beautiful lilting melody and ambient beats marrying together to create a neo-classical ballad. I got a kick out of the gothic beginnings of ‘Moon Dance’, with its descent into Hoedown House not bothering me as much as the albums opener. ‘Minimal Beat’ is easier enough on the ear, with its electro house synths, but I’m totally back on board again with the brilliant ‘Transcendence’, and it’s euphoric Ibiza house sound, making the violin sound at points joyful and at points mournful. ‘Shadows’, also a single, is more interesting with it accompanying video of Lindsey dancing with her shadow, and loses something when listened to without the visual on the album, but its still an ok way to spend a couple of minutes. ‘Spontaneous Me’, despite the dubious title, is quite the bashing commercial house song underneath all the violin madness, and is one of the album’s more interesting moments, whereas closer ‘Stars Align’ tries to vocoder Lindsey’s violin – to mostly unsuccessful results, despite being the only track that comes close to having a vocal hook. It’s a great idea, and something about it nearly works, but the manipulated violin sounds like a cheap horn sample, and despite a last ditch attempt at dubstep devastation at the end, the track never fully gets off the ground. It’s a great idea – neo-classical pieces fused with contemporary club sounds, fronted by a gorgeous young woman whose showmanship and presence on stage makes her so engaging you don’t care if she misses a few notes or is even miming – Britney Spears with a violin, if you will. But there’s something about this album that doesn’t quite come off, making it sound more like a Vanessa May Remix album done on free Mac software rather than a fully fledged body of work. I like it … it’s had repeat listening … but is it the genre-changing masterpiece I was hoping for? No. Emilie Autumn and her amazing industrial Violin Shredding still wins my vote (marrying styles with much more ease and authenticity than Lindsey) but as classical pop stars go, Stirling isn’t half bad. It’s great background music, but hopefully next time it’ll be a more interesting main event.